Casements - Uzor Windows & Doors Inc.
Casement and Awning windows share a common sash and are easy to operate, opening out with a turn of the handle. They are energy efficient and secure thanks to multi-point locking hardware. Upscale exterior contour for high end look. Easy operation in all weather. Accessory grooves for mounting interior and exterior profiles. Hollow air chambers for better insulation and strength. Casement sashes open wide to allow quick egress in case of emergency. Easy operating multi-point locks on casement sash. 3/4" to 1-5/16" overall glass to allow for proper insulating air space. Frame and sash heat welded to increase strength and eliminate air/water leakage in corners. Optional two piece field mulling system. 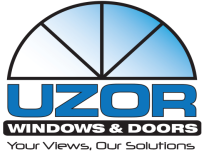 Uzor Windows & Doors Inc.